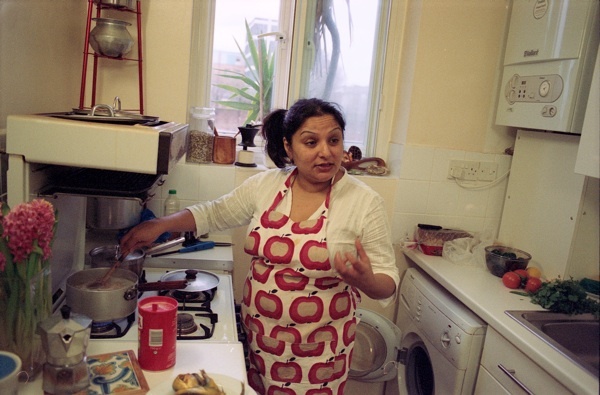 This is Julie Begum of the Boundary Women’s Group dishing up a curry that she cooked for Spitalfields Life contributing photographer Sarah Ainslie. 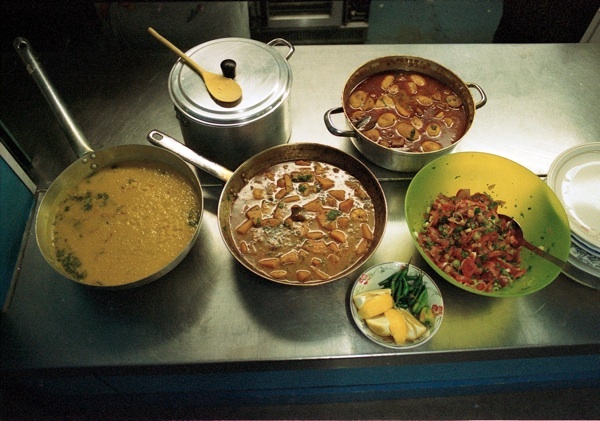 It was part of a collaboration between Sarah and members of the group, in which they cooked food and Sarah took pictures – and, as a consequence, both parties have enjoyed getting to know each other over some delicious meals. Naturally, I took the opportunity to join the feast, dropping in to one of the weekly meetings, that take place every Tuesday morning at the St Hilda’s Community Centre on the Boundary Estate, to learn something of what it is all about. 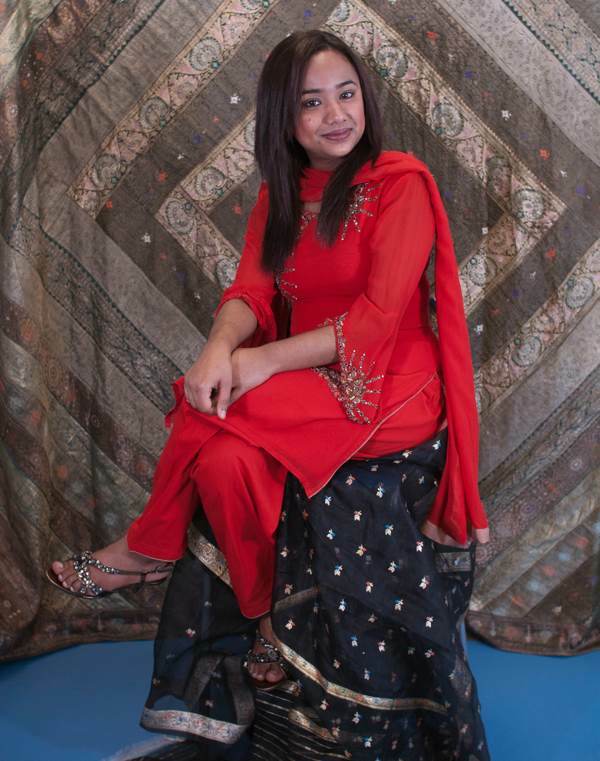 “I’ve been coming since 2005,” explained Sabeha Miah, who runs the group today, “I moved here and I had a young son, and I felt very isolated – but being in the group gives you a chance to breathe and you feel part of something bigger.” When Sabeha first joined, the need was for language classes and so the group all learnt English together. 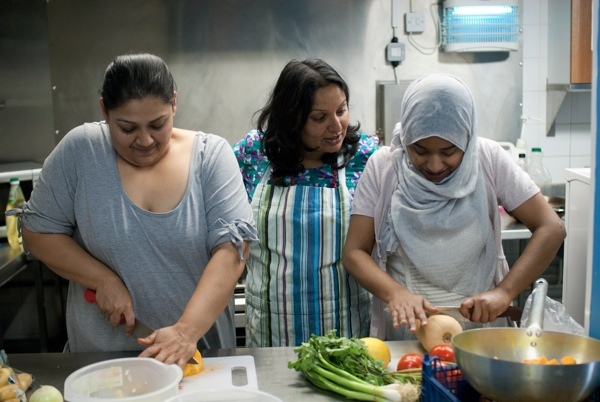 Subsequently, interests have broadened into other kinds of activities including a financial literacy course, the creation of an ambitious tapestry that was displayed at the Museum of London and the development of a food co-op which allows local people to buy food at low prices. 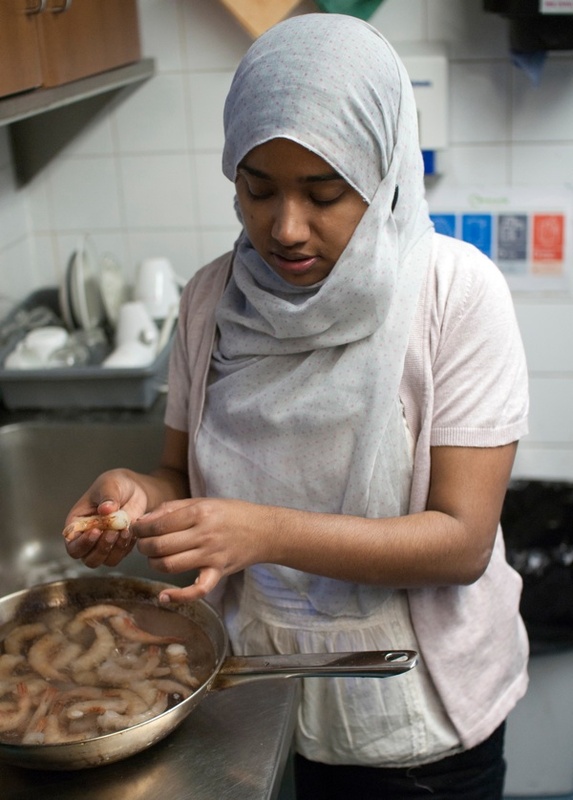 Sabeha Miah’s recipe for Onion Bhajis Finely slice some onions, coriander, fresh chillies and ginger – roughly mix up together by hand. To this mixture add half and half mix besan (chick pea flower) and plain flour until all mixture is coated. Slowly add some warm water to this mixture until a smooth batter is formed around the onions etc (adding more water/bison/flour if you feel it is needed). In a deep frying pan with an inch depth of hot vegetable oil, slowly drop ping-pong ball sized blobs of the mixture in, turning once or twice until golden, then remove. Eat while fresh and warm! 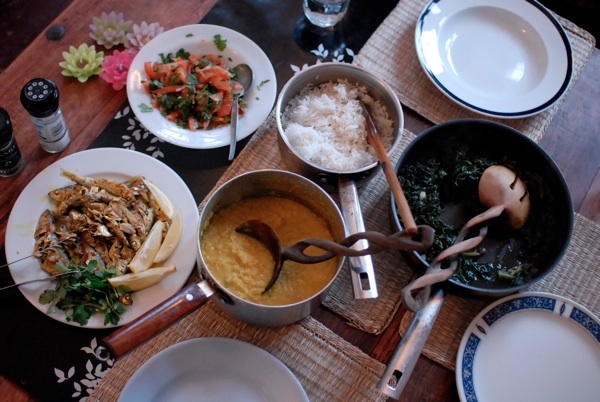 Sufia’s Fish Curry Recipe Fry onion, green chili, bay leaves, curry powder, salt and coriander in oil, then add fish, then water. No need to cook long – the fish is ready quick. 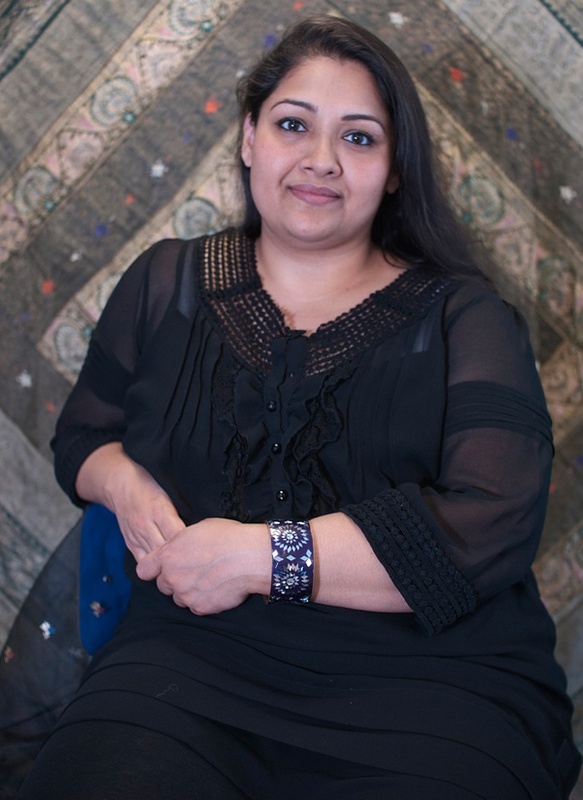 Sultana Begum – My husband likes to get in the kitchen. 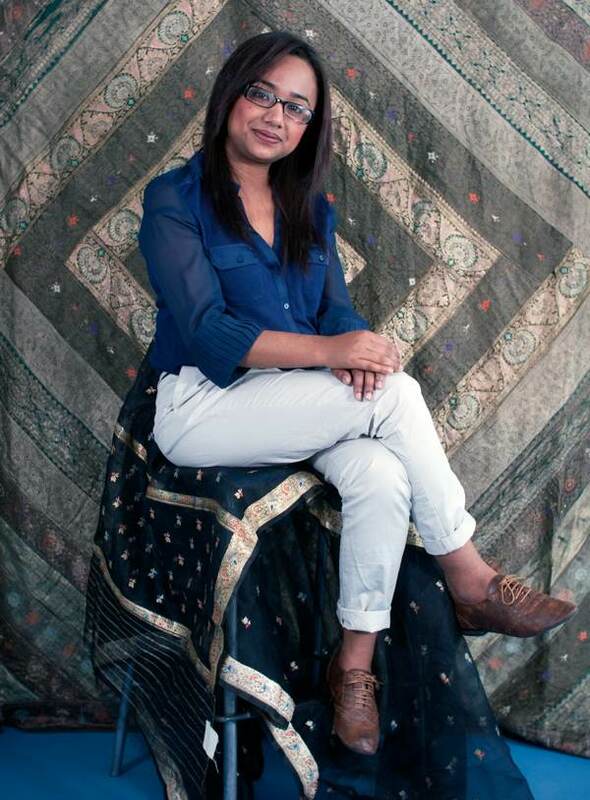 I used to say, “Get out, I’m the woman! 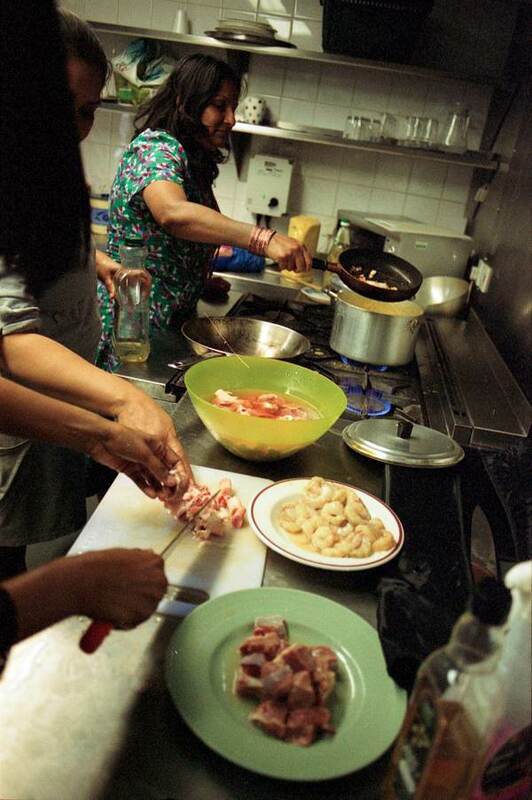 The kitchen is my domain – if you got any suggestions you can cook it yourself!” Now he does cook, things he’s watched me make. He says, “You have to stand there and really lovingly watch your curry while it cooks.” I say, “No,” while it simmers, I go on the internet. 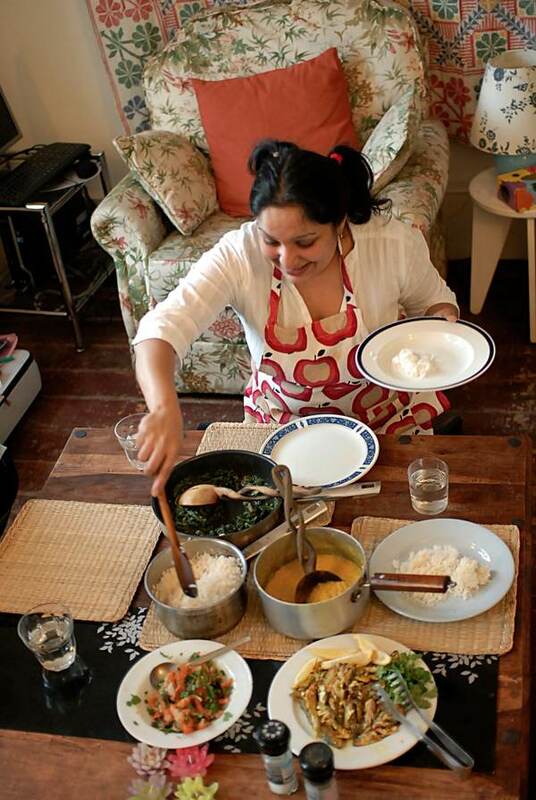 Julie Begum’s recipe for Sardine Curry This is my favourite quick home cooking recipe after a long hard day’s work. Ingredients – half a kilo of sardines, two tomatoes, one onion, three green chilis, one teaspoon of red chili powder, half a teaspoon of turmeric powder, one teaspoon of coriander, one piece of ginger, eight cloves of garlic, one dessert spoon of lemon juice and salt as required. Procedure – Cut and clean the fresh sardines (score on both sides) or just open the tins ( I prefer the ones in tomato sauce). Heat oil in a pan. Add sliced onion, green chili, ginger, garlic and saute well.To this, add red chili powder, turmeric powder, salt, lemon juice and tomato slices. Saute well until tomatoes are done. Add water as required and until fish are cooked. Serve with fresh coriander and a slice of lemon with white basmati rice. Yum! 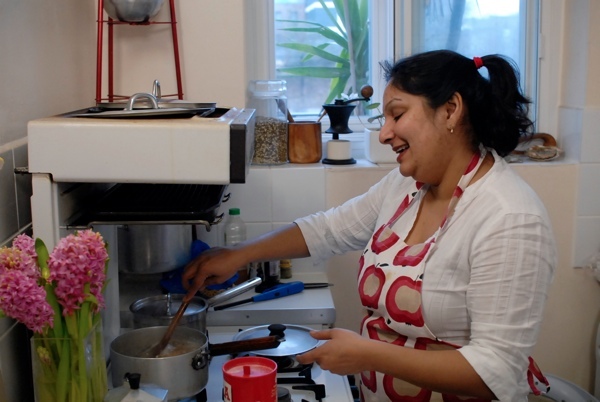 Sabeha Miah – her recipe for simple Dhal Add dhal (two hundred grams of red lentils) to a pot and wash until water runs clean. Put on a stove on a medium heat. Add a teaspoon of haldi (turmeric), salt to taste and a bay leaf. Leave pot covered, stirring from time to time, until all the dhal has turned mushy. Once at this stage – In a frying pan containing two tablespoons of hot oil, add four cloves of crushed garlic and three to four dried red chilis. When garlic has browned and chilis have turned a very dark red, add to the pot of dhal and stir in ( be careful as the oil and dhal will spit). Add chopped coriander to finish. Jobeda’s recipe for Ghajjar Ka Halwar Ingredients: dozen grated carrots, half pint of milk, sugar, cinnamon sticks/cardamon, little bit of single cream, raisins, ghee and mixed nuts. Step one – boil milk with sugar, cinnamon sticks, cardamon, add the grated carrots and let it cook for thirty minutes. Step two – add single cream, for extra sweetness, and raisins after fifteen/twenty minutes. 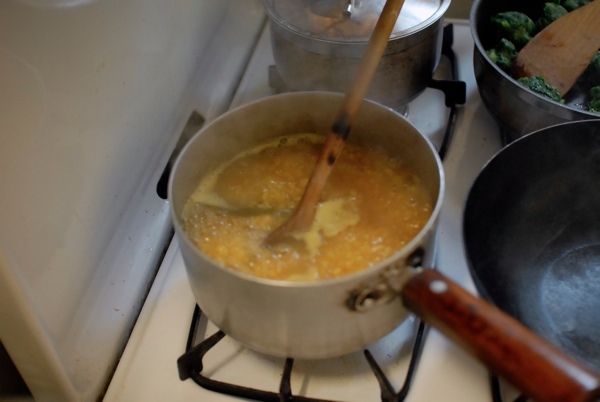 Step three – stir in ghee in the last five minutes. Step four – add mixed nuts for decoration. End result all milk should be gone. i sent for the coriander club cookbook, thanks to you, house is redolent and freezer is full of dal, very very delicious. i can’t think of anything nicer or more revolutionary than ladies’ lunch. i hope you will keep up with the ladies and their plans and recipes. So pleased you included the recipes! 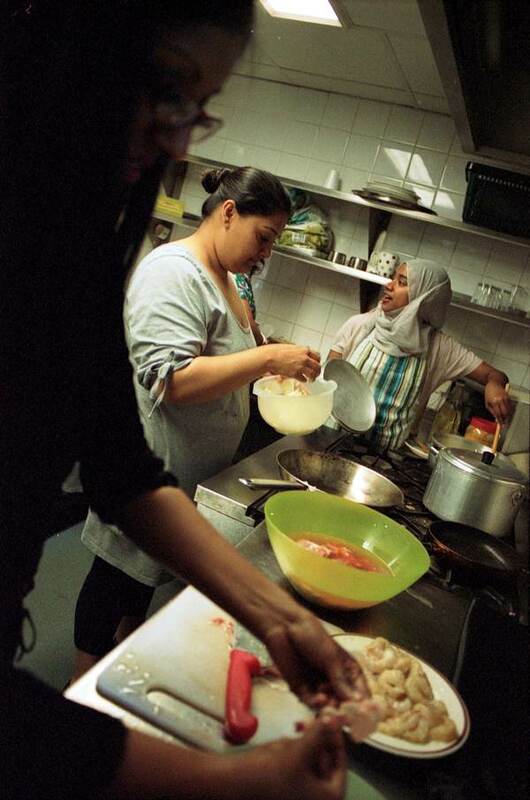 Please tell Julie Begum that her sardine curry is great! 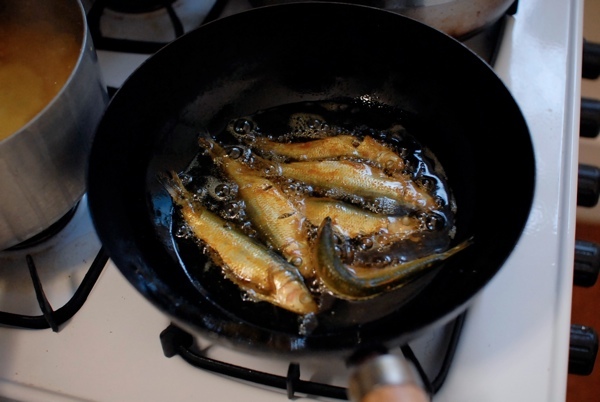 I’d never have thought of using the fish in this way, but it’s lively and very tasty, and just as important, doesn’t leave the kitchen smelling fishy, which often happens with sardines. It’ll be a firm part of my repertoire now. Oh Heavens what a wonderful post! Many thanks.